Talk about melodrama. He had lost his past three major finals, and five of his past six.. And he was not only fighting off a choker-label from the outside, but also from within. He was wondering what had gone wrong, and he hired Boris Becker to coach him on finishing the job. But there was nothing wrong with Djokovic’ game. You cannot win six major championships, as he had before Sunday, and still be a choker. Djokovic was still reaching the finals of majors, but he lost a few to Andy Murray, and he lost to Rafael Nadal on clay at the French Open. Look, there is no shame in losing to Rafael Nadal at Roland Garros. A few years ago at some major, I don’t remember which one, I asked Nadal about losing major finals. He said it was hard, but that he felt the job was to get in position to win majors. The more major finals he reached, the more chances he gave himself to win. Just keep going back, keep going back, and the wins will come. Sure, the old Buffalo Bills might not agree with that. But Phil Mickelson was once considered a choker until he got himself in position enough times. Same with Andre Agassi. And Murray. Djokovic had a historically great year, and then Nadal altered his game and Murray raised his. And Djokovic was not going to win every match for the rest of his life. If anything, he had a letdown after that year. It was only natural. And now that he has won Wimbledon again, moved into eighth place on the all-time list with seven majors, and surpassed Nadal again in the rankings to No. 1, I have some news for him: He’s still not going to win every major final. This was a made-up crisis, though if you truly believe in your mind that something is wrong, then maybe you can make it real. What Sunday’s match did for Djokovic was move him into tennis-legend status. He is still on the outside of Federer-Nadal looking in, even though he has beaten both of them in big matches. They cast the biggest-possible shadows. 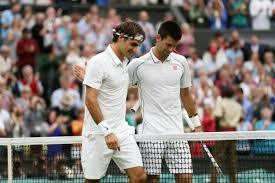 As great as this match was, it still falls behind Nadal’s famous win over Federer on Centre Court. Still, there is something about epic matches, in major finals, that draw the eye and attention and reviews. Djokovic has beaten Murray in finals, but those guys have nearly the exact same game, which tends to make the matches a little boring. 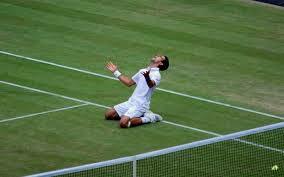 Djokovic has beaten Nadal in big matches, but not at the French, Nadal’s turf. This was a win on Federer’s turf in the biggest spotlight. It carries a permanence for Djokovic. The amazing thing he did Sunday was to keep coming back. He had set points in the first set, but lost it anyway. He had a 5-2 lead, and then match points in the fourth set, but lost that anyway. Federer won five games in a row there, and had all the momentum. Djokovic should have been crushed. In another epic Wimbledon final all tennis fans remember, John McEnroe knocked back Bjorn Borg like that in the fourth set, winning a marathon tiebreaker. Years later, both players still say they can’t believe Borg came back to win the fifth set. That match still lives with both of them. This one will live with Djokovic. From here, he will have more ups and more majors. He will get to 10. And he will also have downs, and lose big ones, too. But those will not be a crisis for this superchampion. If anyone, including Djokovic, thinks he hasn’t reached that level, then I’m going to say the days of melodrama might not be completely gone. Djokovic has won seven majors in the era of Federer and Nadal. Nobody has called Federer and Nadal the “Big Two” in years. This entry was posted on Monday, July 7th, 2014 at 6:54 am	and posted in Novak Djokovic, Rafael Nadal, Roger Federer, Uncategorized, Wimbledon. You can follow any responses to this entry through the RSS 2.0 feed.